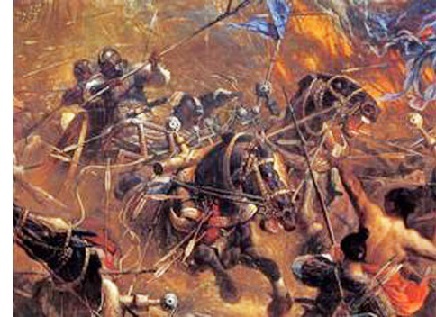 Battle of Talas (751) - The Battles of Zab and Talas, both involving the Abbasid Caliphate, were fought only a year apart. The first overthrew the Umayyad Caliphate and the second was essentially a border dispute between two empires. Following Zab, Caliph as-Saffah sent out troops to survey his new kingdom. Somewhere in Central Asia, they ran into troops from the Tang Dynasty, the empire to the east of the Abbasid. Both had aspirations to expand their borders, and the Battle of Talas was the result. The exact location of the battle is uncertain, but it is believed to have been fought near the Talas River (which runs through present-day Kazakhstan & Kyrgyzstan), from which it takes its name. The size of the two armies is is not known either, but the Abbasid army was almost certainly the larger of the two. The battle was said to have raged for five days, but what turned the tide was a defection of Karluk Turks from the Tang side to the Abbasid (both armies consisted of multi-ethnic troops). Although the Abbasids won, the border of the two empires did not move. It essentially remained at the point of the battle (which interestingly is roughly the same spot where Islamic and Buddhist interests meet today). But the battle is not significant so much because of the sides involved, as it is for one particular event that changed the course of history. Several Tang soldiers taken prisoner were Chinese artisans and, in exchange for their freedom, passed on the knowledge of paper-making to the Abbasids. It's believed that this event eventually led to the knowledge of paper spreading all the way to Europe.